Election 2016: How About You Whine a Little, Democrats? 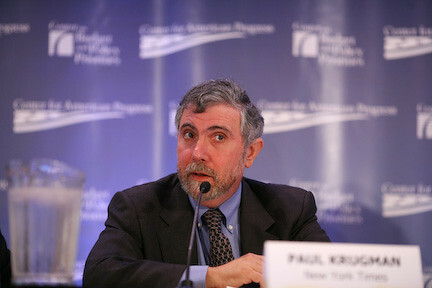 Can someone please call a waaaahmbulance for Paul Krugman? At a little after 9pm on November 8, the economist and New York Times columnist fired the starting gun on America's quadrennial whinefest: "Btw, Jill Stein has managed to play Ralph Nader," he tweeted. "Without her Florida might have been saved." Early the next morning, about the time Hillary Clinton called Donald Trump to concede the presidential election and congratulate him on his victory, the New York Daily News ran 400 words or so on the same note: "The vote totals between the Republican and Democrat in battlegrounds such as Florida and Pennsylvania were close enough to have been swayed if minor party voters had supported Clinton." Wow! What a concept! If people who didn't support Clinton had supported Clinton, Clinton would have won! This is news? Let's talk about who's really responsible for Donald Trump's victory. First we have the people who voted, in plurality numbers in states disposing of a majority of electoral votes, for Donald Trump. Yes, really. Trump voters are largely responsible for Trump winning the election. Funny how that works, isn't it? Running a close second: The Democratic Party. They could have offered voters Bernie Sanders, Jim Webb, Lincoln Chafee, Martin O'Malley, or Rocky de la Fuente. But noooooo ... instead, they nominated one of the most loathed and mistrusted American political figures of the last half century. What could possibly go wrong? They found out on Tuesday, didn't they? Those of us who supported third party candidates (I cast my vote, in Florida, for Libertarian Party nominee Gary Johnson) didn't owe our votes to the Democratic Party or to Hillary Clinton. If they wanted our votes, they should have gone to the trouble of EARNING those votes. Instead they stomped their feet and demanded that we waste our votes on the candidate they supported instead of the candidates we supported, because " well, just because. And now they're throwing themselves on the ground and holding their breath until their faces turn blue because they didn't get their way. No, I don't expect either of the major parties to learn anything from this outing. They'll continue to ignore the concerns of third party voters every four years, then cry a river when those third party voters ignore them in turn. The Democrats made their bed. Let them lie in it. Lying seems to be something they're pretty darn good at.